Adriano Zumbo is a true Australian icon. His smile is nearly as sweet and intoxicating as the delectable delights he whips up in his candy filled kitchen. 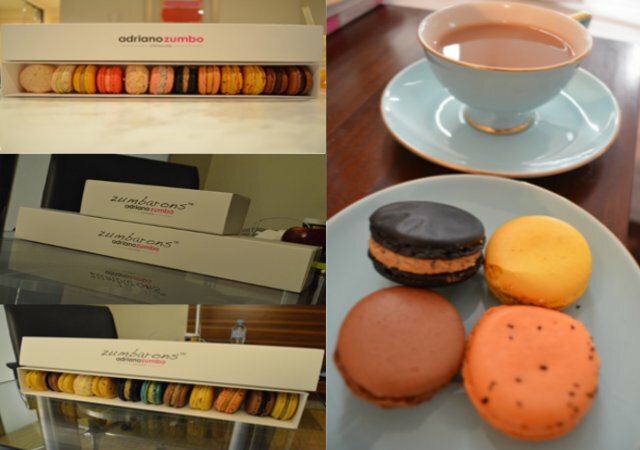 Lucky for Sydney-siders, they have four locations to fill their need for Zumbo's creations. His famed Zumbarons (or macarons, as we like to call them) are what dragged us out on a freezing Sydney night and onto a light rail (tram, as we like to call it) service all the way to the Star Casino at Pyrmont. This particular branch of patisserie features the Dessert Train, which we didn't get a chance to try as it was closed on this particular night, and a huge range of Zumbarons. The flavours change often but on this occasion we were particularly impressed by the Malted Milkshake and Annunziata Chocolate Zumbarons. They were all perfectly delicate and delicious but unfortunately we found a small hair embedded in the meringue of one of the macarons which has put us off for awhile. Considering Zumbo's hairless head could not have been the culprit, we are guessing that one of his employed bakers must have accidently slipped up, which happens in every great kitchen. Despite this, we also tried the tarte aux fruits de la passion, or simply a passionfruit tart. The curd was a bit sour for my liking but the smooth consistency of the passionfruit curd mixed with the crumbly texture of the tart casing was perfect. Overall, his bright and attractive creations will have the hearts of all sweet lovers out there and a stop in one of his patisseries is a must when visiting Sydney. We may be a little disheartened by our experience but don't let that stop you from visiting this truly Australian institution, if not only to get a glimpse of Zumbo for yourself.